Hana' Fedora: Endless effort and Never give up = Dreams come true. Endless effort and Never give up = Dreams come true. Here the thing about funding. You have to have an endless efforts. Sometimes its either you're lucky or unlucky. Sometimes you think that some people doesn't even deserve the scholarship as much as you do but frankly, as cliche as it is "god knows better". Everything that happens there's a reason behind it. There are a few government bodies that offers scholarships/loan to study abroad. Have the effort to survey, researching and always read the newspapers or education magazines. These are the best place to find a scholarships. You have all the time in the world to blog hop why not google for scholarships? Newspaper is where I've got mine. I applied for it, got an interview and got the offer. Here's are some ideas of scholarships that I can think of at 2231 hours. 1. JPA - Only for Master, Check JPA website. 2. Mara - There's always no hurt to google so check the website. -scholarships - for Master and PhD, I don't know the exact numbers but their offers are not as many as JPA. - They also have loans which you can apply but I'm not sure for which degree. check with mara. 3. JPA/KPT(SLAB/SLAI) - For universities staffs and fellowships(soon to be staffs). Send out CVs to the university to become their staff/fellowship. Again, Just email the Univ for enquiries. 4. Non gov/gov organizations - Usually they advertise in the newspapers/magazines. 6. Potential companies (i.e Petronas, Mimos etc) - Of course you have to be their staff first and the offers circulate within their company usually for RnD. Check with your company if they offer any. And go to careers fair and check out which companies offers scholarships. 7. Yayasan (Pahang/Bukhari) - I'm not sure if they offer postgraduate study. But they do offer to undergraduate now and then. Check with them. 8. Biasiswa Yang Di Pertuan Agong - Every year our great Agong will give out scholarships to those who really wants to pursue postgraduate studies in economics, science or law. Shortlisted will be interviewed. Check JPA website. 9. Khazanah Nasional Berhad - Check website for requirements and types of scholarships. 10. 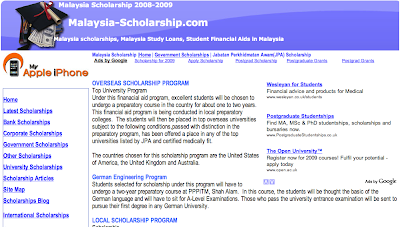 Commonwealth scholarship - google is a great tools. 11. Any scholarships in the whole wide world - Just google! 12. Bank loans but please never the loan shark! This is important! I have to tell you this. If you want to pursue PhD you have to really want to do PhD, not because you want to be abroad. And you have to know what field and major you want indulge in your PhD. That is why PhD scholarship in Malaysia usually are offered to those who's already a staff in a company or government sector. Or those who wants to work in research and development areas. Maybe if you are in other developed countries with a PhD you have so many prospects you have so many options. But in Malaysia? They are short of researchers for now. So if you really want this you really have to love research. It is not easy being a PhD student!. So think about it first before you do this. What do you want to do when you have your doctorate? Researcher or an HR manager? Why do you want to pursue PhD in the first place or do you just want to be glamorous because you're overseas? The effort is not as easy as it may seems. If your lucky you'll have the process smoothly. I had my tough time applying and the process was oh so painful but in the end it surely pays off. "If you just like traveling, why not keeps some money and book an air asia ticket in advance". So true. Maybe nampak mcm best aje coz byk travel. but the truth is.... it's tough. PhD is a serious matter. We need to be independent researchers. I don't know about others, at least for me, blogging is just an escapism. I don't always blog the details of my lab/PhD work (sometimes I do). Therefore, readers don't see the real hardwork, roller-coaster ride of my Phd journey. I hope all PhD students out there will come back to Malaysia with flying colours. There's a worrying statistics actually, some students came back to Malaysia with NOTHING. I hope all of us will not be in that statistics. Don't waste the tax payers money. Just a reminder to myself too. However, if research is really your thing, go ahead. PhD is just a beginning. im goin thru my tough times now (i mean d same process you were goin thru before u're where u're now).. rite now m still waitin for my scholarship's interview result. if my luck is there, m gonna do my masters in aussie. im so proud of u for being so young (we're in d same age actually) & sudah started doin ur phD! may i ask u sth if u dun mind answerin? is "research thin" is really2 ur thing? woww.. i envy u girl! i dont think i hv d courage like u do.i decided to do my masters pon sbb nk broaden my expertises. saya pembaca setia blog kakak. adik minat sangat nak melanjutkan pelajaran adik ke luar negara macam kakak. saya suka sangat tengok hidup kakak yang happy dan fun di sana. nampak sangat seronok. boleh tak kakak bagi saya info sikit cara cara macam mana nak lanjutkan pelajaran saya. owh adik ini sungguh bersopan santun..boleh tk akak campak adik dlm lombong kt sebelah rumah ni??? dah bau lombong n kene spray perfume sket..
p/s: mana hilangnye chatter box mu yah?